Have you checked out my tutorial for making a kid's Dalek costume? It's been a year since our kids dressed up as Doctor Who characters for Halloween. In 2016, we attended Time Traveler's Weekend at the Ohio Renaissance Festival. Our son wanted to be the 10th Doctor that year, so that's exactly what we made him. If you've ever searched for Doctor Who costumes for children, you know first-hand how hard it is to find costumes that are inexpensive and actually look like Doctor Who characters. This was definitely the case with our search. That's why I decided I had to get creative and put together a costume on my own by purchasing items separately. Here's what I bought and how much I paid for our child's 10th Doctor Costume. We purchased this Spring Notion 3-Piece Pinstripe Suit for about $60. Yes, it's a little pricey, but this suit can be reused for as long as he can fit into it, so it was absolutely worth the buy. Also, we didn't need the vest for the costume, but he could use it later for other occasions if he wanted. I was so pleased with the suit. It's much better in person versus what it looked like online. It's such a high-quality suit. I loved it. I would certainly advise ordering a size up, however, as the pants are made just a smidgen on the small side. 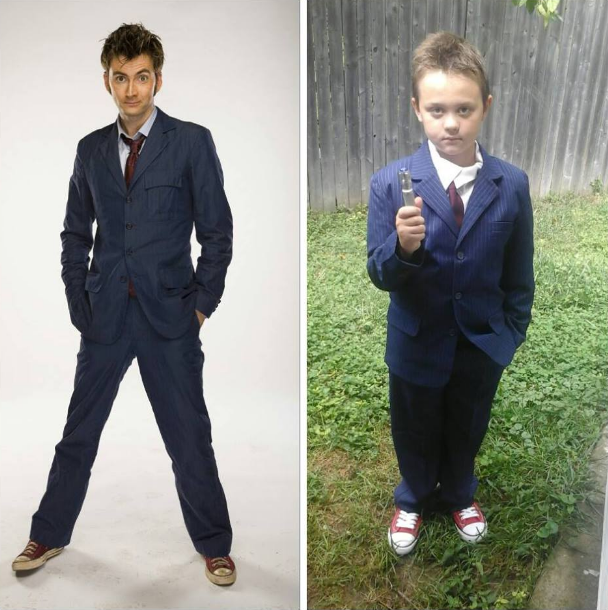 Note: We did not pick up the brown trench coat for our son's 10th Doctor costume because it was going to be a little too warm on the day of the festival. Next up, we needed shoes! All Whovians know that the 10th Doctor wears Converse (he seems to switch between white and red). Now, I wasn't willing to pay over $50 for a pair of Converse because I wasn't even sure if my son would wear them when he wasn't wearing his Doctor Who costume. So, after hours and hours of searching, I decided that I wasn't having any luck searching for kid's sneakers that looked like Converse. That's when I started looking at women's shoes! I came across these Women's Classic Canvas Sneakers for a steal! They were only $10.05, they came in six different colors, and after checking the size chart, I realized that I could adjust the size selection based on the measurements of my son's feet and the company's size charts. Carter is normally a "Big Kids" size 3.5, but he would wear a women's size 5 in these shoes. They fit perfectly and it sure beats having to pay over $50! Once we had the shoes purchased, we needed a tie! Even though the 10th Doctor changes his tie often, we decided to go with the one we've seen most—the burgundy tie! This one was perfect—the colors matched the colors that The Doctor wears (it's more evident in person). It was around $10 and can be used again and again. You don't have to tie it, as it secures in the back with Velcro. Then, we needed a shirt to go under the 10th Doctor's suit jacket. We already had a white button up shirt for kids that we picked up on Amazon last year when he dressed up as the 11th Doctor for Halloween. 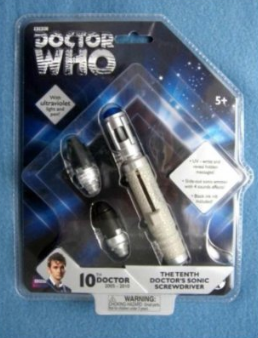 Now, since we're talking about The Doctor here, of course he needs his Sonic Screwdriver! We picked up the 10th Doctor's Sonic Screwdriver and it is awesome! It has two separate nibs—black ink and UV ink. The UV ink disappears and then your "secret messages" can be revealed with the UV light on the end of the Sonic Screwdriver! It has two different sounds and can be extended to reveal a really neat coil in the center of a transparent casing. This is honestly the coolest Sonic Screwdriver I've seen on the market. Finally, The Doctor wouldn't be complete without a companion—er, well, we didn't have a companion for him per se, but we did have a Dalek! 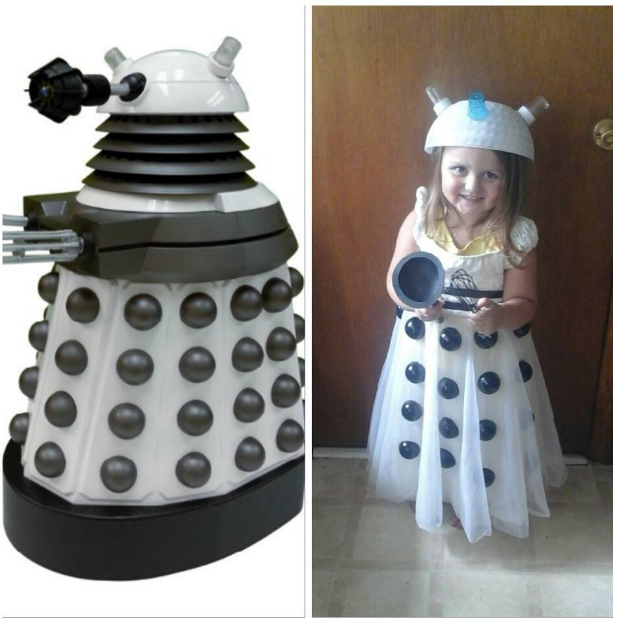 Above is the image of the kids Dalek costume that I put together for my daughter! We hope your fall events are festive and fun!